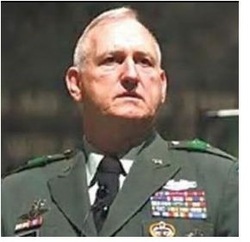 Retired Army Lt. Gen. William “Jerry” Boykin is warning that Islamic Shariah law already is in the United States, and is forming a cloud over the future of the nation. Boykin, addressing a packed house at a synagogue today in Stoughton, Mass., said, “There is a threat to this country from Shariah and the Muslim Brotherhood,” noting the Muslim Brotherhood has had a presence in the U.S. since at least 1962. “The new Egyptian president, Mohamed Morsi, said he joined the Muslim Brotherhood in 1978 while he was in the United States of America. People who say that the Muslim Brotherhood is not in America are not dealing in reality,” Boykin said. He said even Muslims pay a price for being indifferent to the agenda of the radical Muslim Brotherhood. “Muslims who are not pushing for Shariah in the United States are pushed aside and don’t have a voice. They’re often marginalized in their mosques and sometimes not allowed to participate,” he said. Boykin also says that Shariah law has deep ramifications for the United States. He continued, “The Europeans didn’t take the threat seriously and now Steyn has said that it’s not going to be more than a generation before Europe is overcome.” Boykin told the crowd of the Muslim Brotherhood’s master plan for the United States. “The Muslim Brotherhood is working to control the dialogue in the United States, ensuring that people don’t talk about Shariah or its objectives for the country,” he said. “It’s gone into the deepest halls of our government too. It was no less than FBI Director [Robert] Mueller that had a March meeting with the Muslim Brotherhood. The leader of the Brotherhood complained about the counterterrorism training manual,” Boykin said. “In response, Mueller allowed the Muslim Brotherhood to expunge over 1,000 documents from the training manual,” Boykin said. “So please don’t say it can’t happen here. You’ve been told a lot of lies and you’ve been told it’s a religion of peace. You’ve been told that Islam and democracy are compatible and that’s a lie. “We’ve been told we all worship the same God. That’s a lie. My God, you can have a personal relationship with. With Allah, you can’t have a personal relationship,” he said. He noted that the roots between Israel and the United States go deep, and it’s a necessary alliance for the United States to honor. He also blasted the Obama administration for its neglect of Israel and for its failure to take Iran seriously. “We make a major mistake if we think Mahmoud Ahmadinejad is a clown. He is deadly serious,” Boykin said. “People who think he’s a clown like Hugo Chavez are dead wrong and know nothing about the theology of Ahmadinejad,” Boykin said. Boykin says that Ahmadinejad takes seriously the Islamic eschatological belief in an apocalypse of the Jews followed by a return to the final imam. “Academia has been infiltrated. Churches have been infiltrated. The first Muslim Brotherhood organization in the United States is the Muslim Student Association,” Boykin said. Boykin said this as a professor at Luther College proclaimed that he believes Jesus was Muslim. Boykin then turned his attention to the political relationship between the government and Israel. “The last four presidents have actually harmed the country’s relationship with Israel, but this one is especially bad,” Boykin said. “This administration has told the Israelis to go back to the 1967 borders, and that’s like telling Israel to commit national suicide.” The general had some very harsh words for the way Obama personally has treated Israeli leaders. “We welcomed the Chinese to the White House. We had an official state function and rolled out the red carpet,” Boykin said. “But if some reports are correct, the president made Prime Minister Benjamin Netanyahu sit in a room by himself for about an hour while the president went off and did something else. “No president has ever done that to a sitting Israeli head of state,” he said. WND reported recently that Israel and Iran may already be fighting a proxy war in the Sudans, with Israel supporting South Sudan and Iran developing deeper ties to Omar al-Bashir in Sudan. A war between Iran and Israel is a matter of deep concern for Boykin. “Prime Minister Netanyahu may be waiting to see if Obama is re-elected. If Obama is re-elected, the Israelis may be willing to launch a pre-emptive strike against Iranian nuclear facilities,” Boykin said. Two Israeli news sites speculate on how adverse a second Obama term would be for Israel. Boykin agrees. “If Obama is re-elected and he doesn’t have to worry about another four years, Israel will be on their own to have to act apart from any U. S. help which will likely not be forthcoming in a second Obama term,” Boykin said. Boykin also has stated that a war between Israel and Iran is inevitable, and the U.S. needs to stand with Israel. Read Gen. Boykin’s own tales of heroism, in “Never Surrender: A Soldier’s Journey to the Crossroads of Faith and Freedom.